I took up walking last summer, as a means to losing some baby weight while not feeling like I was actually exercising! I have to confess I was horrified how unfit I had become, and I struggled to walk up even slight inclines without getting out of breath! Mr G is a keen walker, and this kept me motivated, as it was something we could do together, taking in breath taking views and even with the boys in tow with the aid of a baby carrier! I was lucky enough to be sent a pair of Hi-Tec National Trust Altitude IV walking boots to review, these boots have been designed with their environmental impact taken into consideration, while maintaining all the performance you would expect from a high performance walking boot. When the boots arrived, I instantly noticed that they are lightweight for a walking boot, certainly lighter than my current pair! The soles are substantial, the inners are well padded and the tops around the ankles are designed to offer maximum support and comfort – ideal for walking across very uneven terrain. I initially tested the boots out during the snow at the start of February, I took the opportunity to test how they perform in icy conditions and while I could only walk locally, I did find that the soles gripped well and it instantly gave me confidence in my new boots! 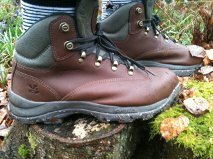 I have quite narrow feet, but I was well supported by the boots and the lacing enabled me to get them to fit perfectly. Comfort wise, I find the boots very comfortable, a great combination of support and cushioning meant I’m happy to walk that bit further, in the knowledge my feet will still be comfy when I get home! I have jumped in puddles and walked until I was ridiculously hot, but my feet have remained dry and comfortable! Best of all, when I scuff them and they start to look like they might be ‘tired’ a good clean brings them up like new again! The next challenge they’re helping me achieve? Walking up Snowdonia this summer! Previous PostMake your own Easter Chicks (or Angry Birds! )Next PostWhat happens in Huggies stays in Huggies!